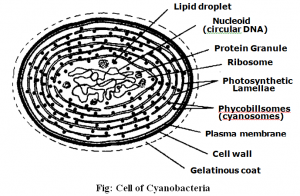 Cell type: They are true prokaryotes. They lack true nucleus and nuclear membrane. Size and Shape: They vary greatly in size and shape. They range in diameter from Ito I Opm. Vegetative structure: They may be unicellular or form colonies of different shapes or form filaments. The filament is composed of trichomes. Trichome is a chain of cell. Each filament is surrounded by mucilaginous sheath. A trichome with its enclosing sheath is called filament. Trichome may be branched or unbranched. Locomotion: They lack flagella. They use gas vesicle to move in the water. Many filamentous species show gliding movements. Some filaments shift their position laterally in water. 1. Cell wall and mucilaginous sheath: They have primitive cell types. Cell is surrounded by cell wall. Cell wall is composed of cellulose and pectic substances. Mucilage form sheath around the cell. Sheath increases the water holding capacity of cell. The colour of sheath protects the cell from strong light. (a) Centroplasm: The central region is colourless called centroplasm. Centroplasm has central body. It contains chromatin material. Nuclear material is not present in the form of chromosome. It is present in the form of crystalline granules. It may be called primitive nucleus. But it lack nuclear membrane and nucleolus. (b) Chromoplasm: The outer region is blue green pigmented. It is called chromoplasm. Chromoplasm contain pigments chlorophyll, carotine, myxothanhophyll and phycocyanin. It also contains oil droplets and glycogen. Certain gas vesicles are also present in it. 3. Photosynthetic system: Their photosynthetic system is closely resembled to the eukaryotes. They have chlorophyll and photosystem II. They use water as electron donor. They release oxygen during photosynthesis. Therefore, they carry out oxygenic photosynthesis. They use phycobilins as accessory pigments. Photosynthetic pigments and electron transport chain components are located within the thylakoid membrane. These pigments are linked with particles phycobilisomes. A blue pigment Phycoeyanin is their predominant phycobilins.Cyanobacteria fix CO2 through the Calvin Cycle. 4. 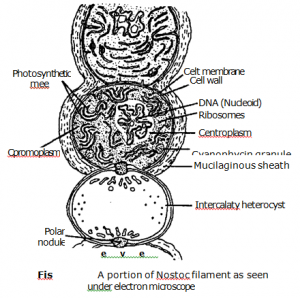 Heterocysts: The filaments of some cyanobacteria have special cells called heterocysts. They are enlarged barrel shaped cells. There are different views about the nature of heterocysts. According to one view, they are vestigial spores. According to second view heterocysts have role in nitrogen fixation. a) Binary fission: It is a simple cell division. The genetic material replicates. They move to opposite poles. A ring like outgrowth appears in the middle of the cell. It divides the cell into two. ) 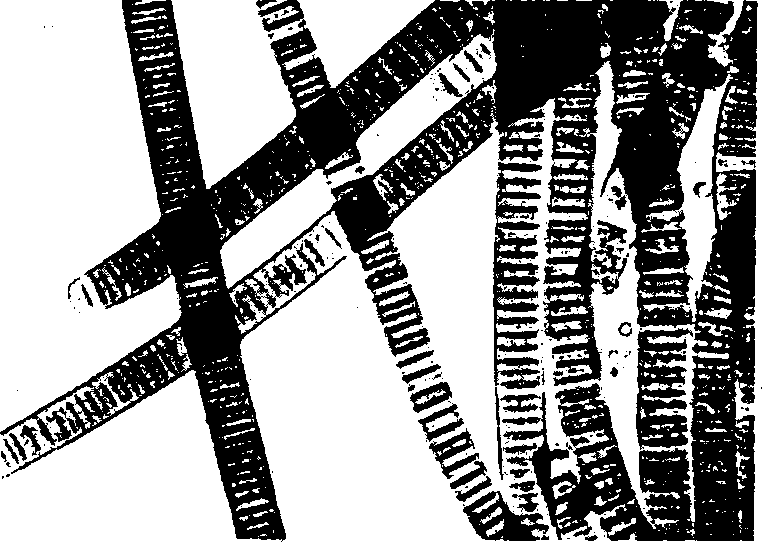 Fragmentation: The filament of the cyanobacteria breaks to from small fragments. Each filament grows to form new colony. Hormogonia: The broken pieces of a filament are called hormogonia. Double concave discs of gelatinous material are formed between two cells. It is called separation disc. The filaments break at these points and form hormogonia. Hormospores: Under unfavourable conditions, some hormogonia develop thick wall. They are called hormospores. They germinate directly into new filament in favorable conditions. Akinetes or arthrospores: Akinetes are thick walled, enlarge reproductive cells. The cell stores reserve food and enlarans. It secretes thick wall and become akinete. Akinete has outer wall exospore and inner wall endospore. They are yellow or brown coloured. The• akinete germinate immediately after raining. 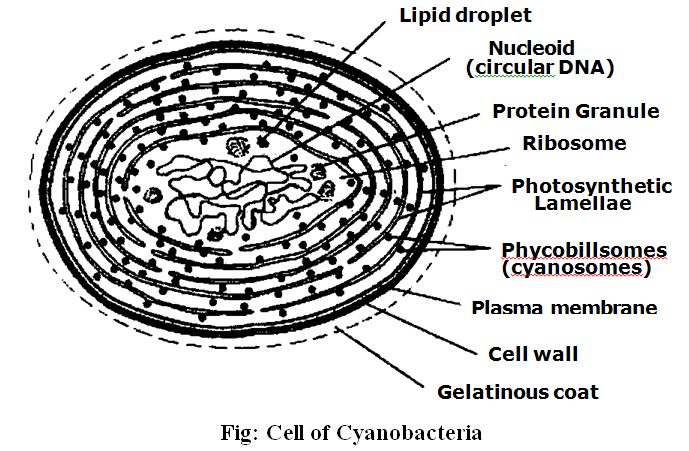 Endospores: Some cyanobacteria develop endospores. The protoplast of certain cells divides and develops endospores. The old cell wall burst and endospores come out. Exospores: They are cut out at the tip of some branches. They get separated and develop new filament. 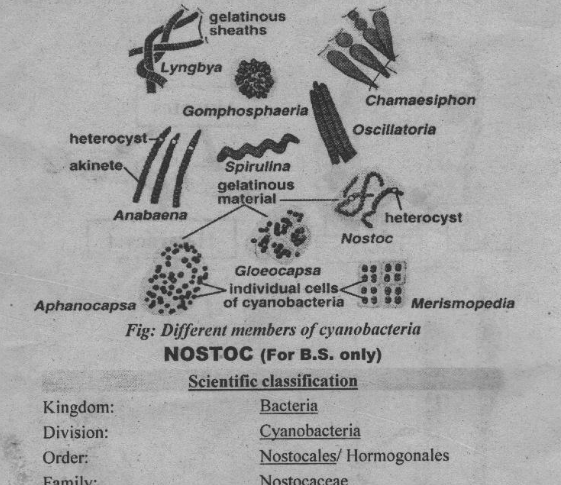 Nostoc is a genus of cyanobacteria. It has 29 species. 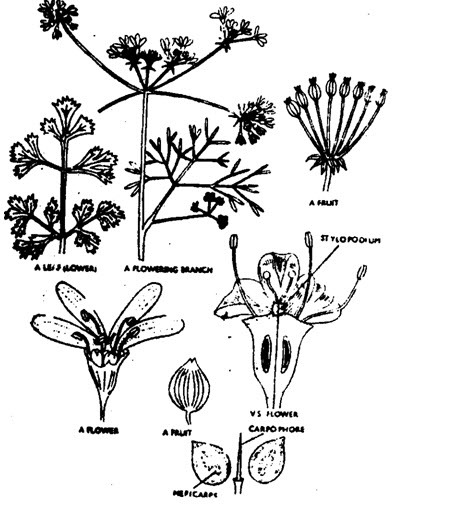 Its common species are N.caneunt, N.commune, N.endophytunr, N. rivttlare etc. It is found in a variety of environmental niches. It forms colonies composed of filaments of moniliform cells. This colony is packed in a gelatinous sheath. I. Nostoc is found in soil, on moist rocks, at the bottom of lakes and springs (both fresh- and saltwater)..lt is rarely found in marine habitats. They form free floating balls in freshwater bodies. Sometimes, these balls may be attached to some object. They may also grow symbiotically within the tissues of plants, such as homworts. They provide nitrogen to its host through heterocysts. Heterocysts are terminally differentiated cells. They are also found as an algal component of some lichens. They are also found on tree trunks. They form mucous or leathery outgrowths on the tree trunks. Nostoc colony is not seen on the ground in normal conditions. But after rain it swells up and forms conspicuous jelly like mass. Therefore, it was earlier thought that they fall from the sky. Therefore, their popular names are fallen star and star jelly. They are also called witches’ butter. The colony is almost rounded. Its size may be as large as hen’s egg. substance. It forms a jelly like lump. A large number of trichomes are encapsulated within a sheath or skin of this lump. or more enlarged cells, called heterocyst. 2. Protoplasm is composed of two parts. The peripheral part is called chromoplasm. It contains pigment. Hence it is colored. 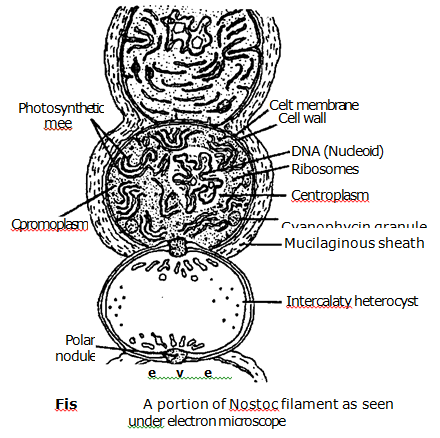 Plastids are absent in Nostoc. The central part of protoplasm is colorless. It contains nucleus like material called central body or chromatin granules. In some colonies pseudo-vacoule are present. Their reserve food material is glycogen and oil droplets. Heterocysts are larger barrel shaped cells. They are specialized for nitrogen fixation. Golgi bodies, endoplasmic reticulum and mitochondria are absent in their cells. 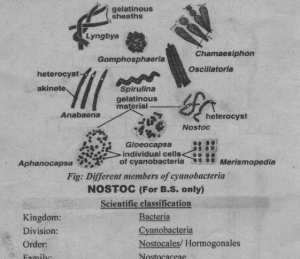 Sexual reproduction is not reported in specie of Nostoc. Nostoc reproduces by following asexual methods. such time as the moisture disappears. Then many of the cells form spores. These spores form the blackish mass seen in dry weather. These spores are capable of surviving drought and ultra violet radiation in the summer. These spores grown in spring and form new colonies. 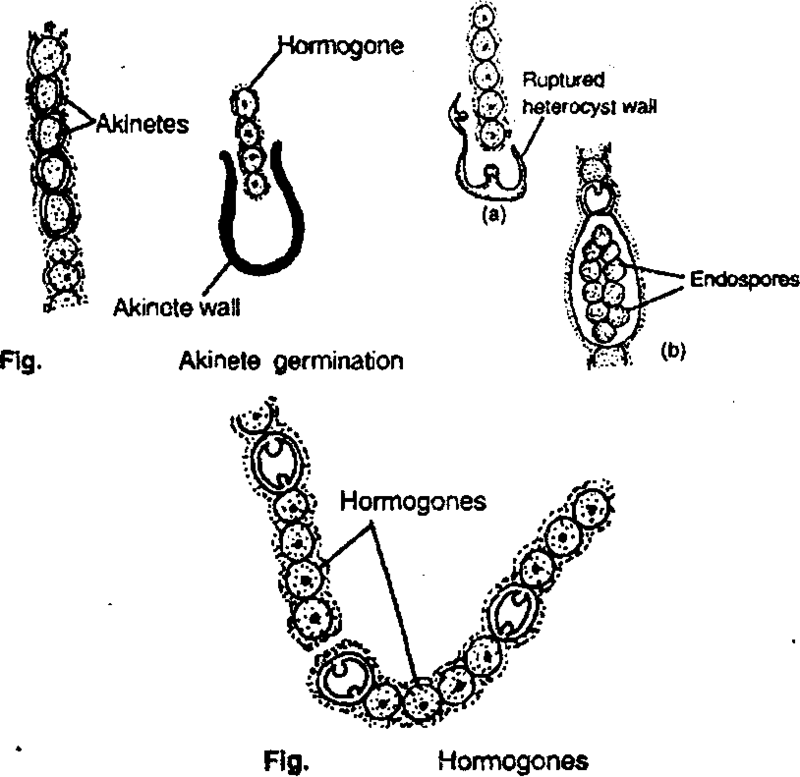 Hormogones formation: It is the most common method of asexual reproduction in Nostoc. Hormogones are short length filaments. They develop into larger lengths by vegetative reproduction. 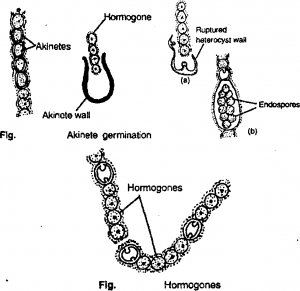 Heterocysts are the point at which the filament breaks into hormogones. Hormogones may also formed by the breaking of filament or decay of filament at some other points. Hormogones may retain gelatinous envelope. But in some cases, hormogone come out of the gelatinous envelope and develop into new colony. In some cases, hormogone do not come out of the colony and grow to form new trichome within the parent colony. Thus a large number of trichomes are developed in the same colony. 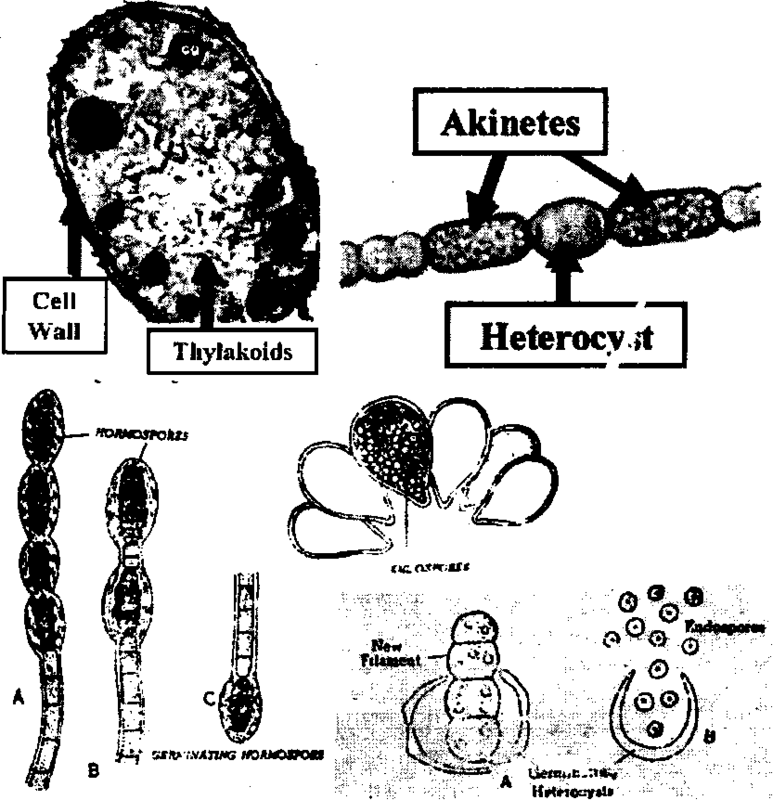 Akinetes or Anthrospores formation: Akinetes are formed during unfavorable conditions. Akinetes are thick walled spores with a large amount of reserved food material. Their wall is two to three layers thick. They have granular protoplasm. Akinetes have reserved food material in the form of cyanophycin starch grains. Akinetcs are capable of forming new filaments. The Akinetes can survive dry conditions. These ultimately start new colonies elsewhere where rain comes. 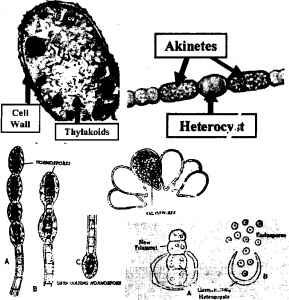 Ileterocysts: Heterocysts are not common means of -eproduction in Nostoc. But in Nostoc commune heterocysts germinate to form new colony’. The contents of the heterocysts divide into two and then four cell germiling. The wall of heterocyst ruptures or dissolve and genniling cells come out. They germinate to develop new plant. Endospore formation: Endospores may form in N. commune and N. tnicroscpicum. Endospores are formed by the division of content of heterocyst. They come out and develop new plant. I. Nostoc contains protein and vitamin C.
2. Nostoc species are cultivated and consumed as a foodstuff, primarily in Asia. The N. flagelliforme and N commune varieties are consumed in ‘China, Japan and Java, N. commune is also consumed in the Andes. The preferred variety in Central Asia is N. ellipsosporunt. 3. Fat choy (Nostoc flagelliforme) are abundantly consumed in china. But it has no nutritional value. It also contains Beta­methylamino L-alanine (BMAA). a toxic amino acid. This amino acid can affect the normal functions of nerve cells. It may cause degenerative diseases such as Alzheimer’s, Parkinson’s, and dementia.